Just as promised Oppo is now selling the CyanogenMod N1. The first CyanogenMod retail smartphone is going for $599, which was the initially expected price. In Europe, the smartphone is selling for €448 for the 16GB version. 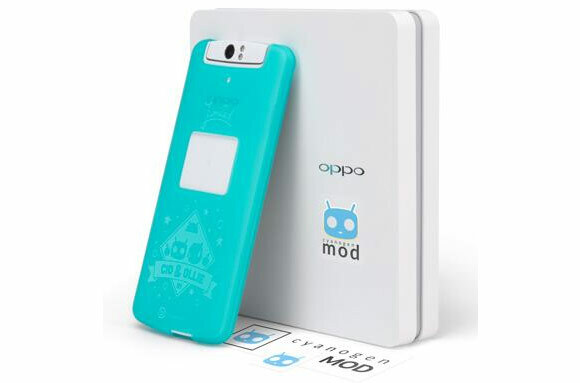 Just like the regular Oppo N1, this one comes with the O-Click accessory, but in addition will also receive a special CyanogenMod cover as well as a special sticker pack. If you happen to own the standard Oppo N1, you can go ahead and download the CyanogenMod image that the ROM maker has released today. The second source link below will also give you access to the Kernel image that you'll need to flash in order to install CyanogenMod on your N1. Currently, the CyanogenMod Oppo N1 is running CyanogenMod 10.2 based on Android 4.3 Jelly Bean. However, the team behind the custom ROM is hard at work on CyanogenMod 11 (based on Android 4.4 KitKat) so an update for the N1 is coming shortly. But Apple, Windows, Blackberry, iPhone are fine? These freaks will never have success as linux freaks do not have: simple lessons are ignored: nobody likes stupid names as cyanogen.